Our cozy apartment is ideal for a stay in Old Town. Thanks to its ideal location, between Old Town and the Jewish Quarter, you can visit many interesting places that are nearby. The apartment has a floor to sleep with a double mattress where you can watch TV. Separate kitchen offers a variety of functional devices. Ideal for relaxing after a busy day in Prague is a modern bathroom with heated floor, daylight and bath. 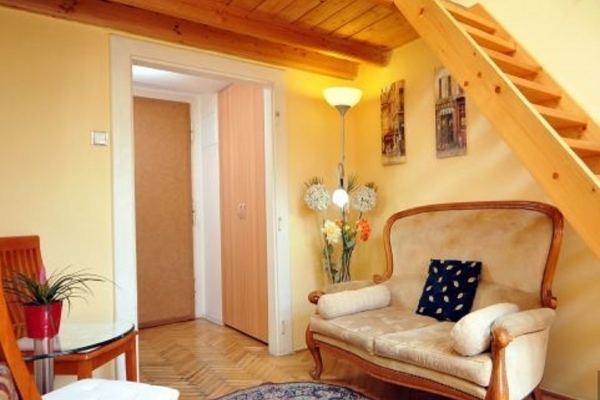 From the apartment you have easy access to the old Jewish quarter of the Old Town Square and also in Pařížská street, which is synonymous with luxury and you find here shops of world famous brands. of 100,- Czk per hour.